The Maestro’s back in this exciting encore to Notes of Life! Eerie music fills the air in Vienna, where shadows terrorize people in the streets. Two musical prodigies have gone missing. Can you save them without striking a single false note? 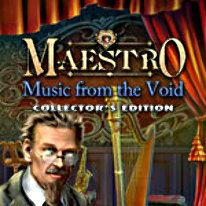 Solve the mystery of the Music from the Void as you play this Collector’s Edition version of the game, including a hefty bonus game and neat extras! -Hours of bonus game play!